Susan over at She’s Becoming DoughMESStic had the idea to get a few blogging bakers to send yummy things to her cousin’s unit in Iraq. Apparently, she underestimated the willingness of this slice of the blogging community to bake for a good cause (or a bad cause, or, really, no cause at all). The one-time thing has turned into a project, Operation Baking GALS (Give a Little Support). Check out the website, and feel free to join in. Despite the name, my 16-year-old future Marine #1 Son offered to help out with this project. We chose two Dorie recipes (of course! 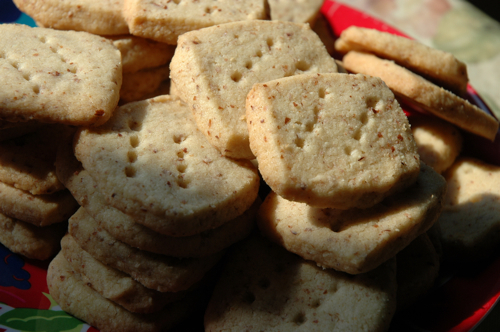 ): Oatmeal Spice Shortbreads and Brown Sugar-Pecan Shortbreads (although, necessity being the mother of substitution, ours are Brown Sugar-Almond Shortbreads). I wanted to stay away from chocolate and anything too crumbly, and I thought shortbread would survive the weeklong journey to the desert. I hope I was right. 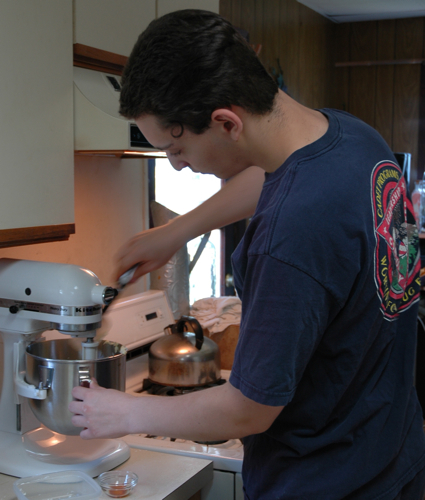 So he made the dough and I baked it, and today we packed up five dozen cookies and sent them off. The whole packing/shipping thing was more involved than I realized, although had I actually thought about it a bit I would have realized it would be complex. No matter. It was good, and we’ll do it again. This entry was posted Wednesday, July 30th, 2008 at 8:21 pm	and is filed under Uncategorized. You can leave a response, or trackback from your own site. I joined this as well, but haven’t made my bars yet. Tell me how you packaged yours? I used my FoodSaver to package them in plastic, then put the bag inside a rectangular plastic container, which then went inside a priority mail box. If you look at the Operation Baking GALS website, though, there’s extensive advice from a military wife who sends baked goods all the time, and she does it without the FoodSaver.